While reading the New York Times obituary of Maurice Sendak this morning, your blogger could not help looking up from the kitchen table, above which an illustration from his book In the Night Kitchen has hung for many years. His work was part of the fabric of our children's lives, well beyond his best known work, Where the Wild Things Are. Sendak had a complex nature. "I don't write for children. I write and somebody says, 'That's for children,'" he told Stephen Colbert in an interview this January. His stories and characters were strange looking and sometimes scary -- and yet children could identify with them. His brillant collaboration with Carole King in the musical Really Rosie, which was performed off Broadway and made into a television special and eventually into a DVD, took four of his stories (Chicken Soup with Rice, Alligators All Around, Pierre, and One Was Johnny), which were collectively known as the Nutshell Series, and brought them vibrantly to life. In a houseful of small boys, Pierre "who would only say 'I don't care'" was a well-loved cautionary tale, and our sons had the words to all of the story-songs memorized. 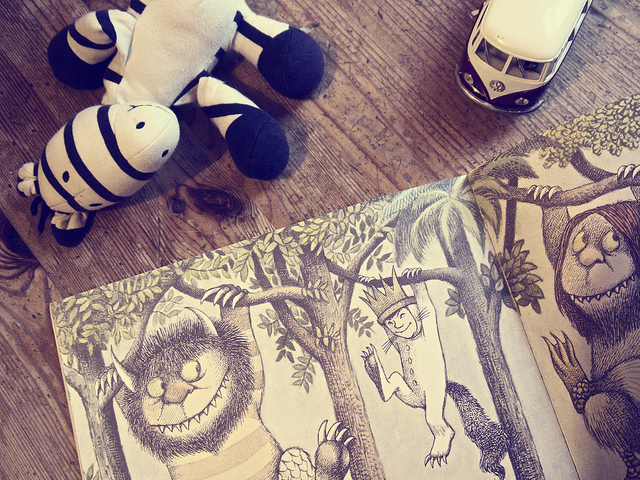 If you or your children haven't yet had the pleasure of delving into Maurice Sendak's world, you may want to give some of his books a try. They are not standard children's fare -- but then, as Sendak noted, they weren't really written for children.